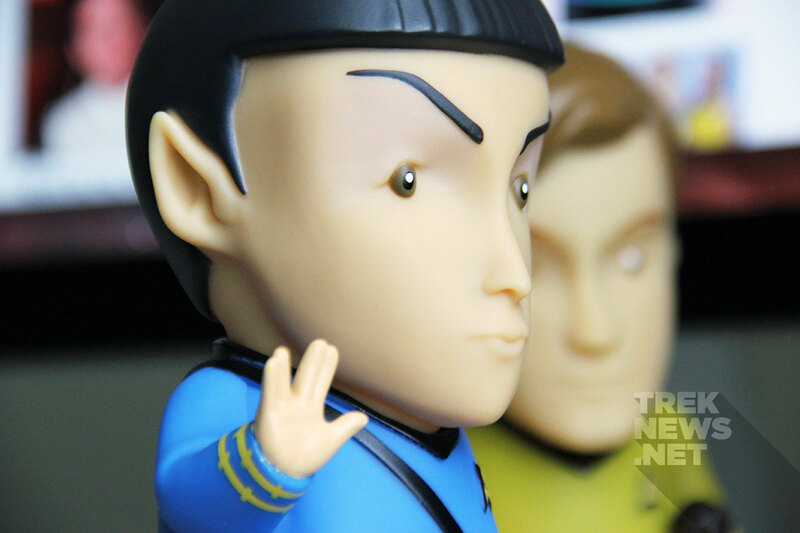 Collectible vinyl figures and wireless speakers are both incredibly popular right now. 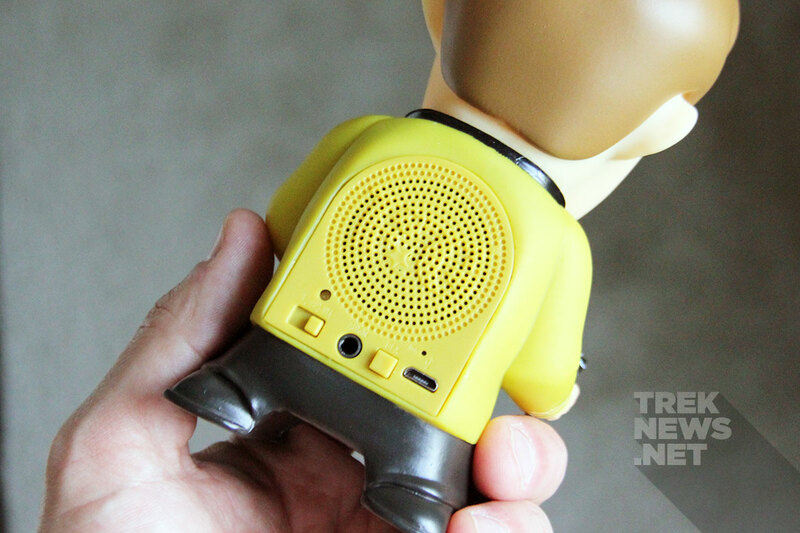 Los Angeles-based FameTek recently combined the two and released likenesses of Star Trek‘s Captain Kirk and Mr. Spock, both capable of Bluetooth audio. 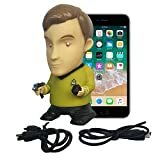 The 6-inch officially licensed talking figures are able to wirelessly stream from a computer, smart phone, tablet or MP3 player. The built-in mic makes it possible for phone calls to be taken through the units and the rechargeable Lithium-Ion battery allows for up to 6 hours of wireless use. This review is based on my use of each unit, connected via Bluetooth, using a MacBook Pro and an iPhone 6. 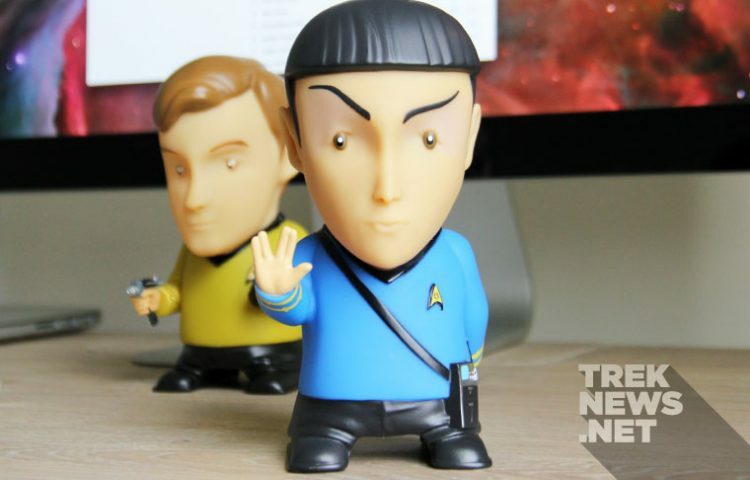 The stylized figures depict two of Star Trek’s most iconic characters with giant heads, their respective uniform colors and some nicely molded details. 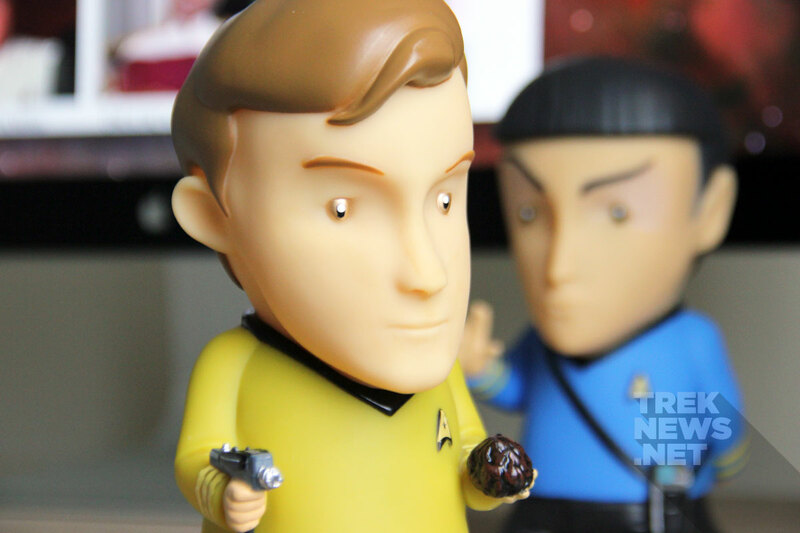 The Kirk figure comes with gold eyes (yes, gold), holding a Tribble in one hand and a phaser in the other, while Spock has a Science Tricorder on his side, his right hand extended in a Vulcan salute and his left hand clenched behind his back. The styling of the figures is a little different than anything I’ve seen before, primarily because of the extremely stubby legs and elongated feet. However, some aesthetic choices are reminiscent of other collectible vinyl figures, including Funko’s popular Pop! line. It should be noted that the figures’ arms and legs, along with their heads, are molded in place. 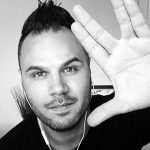 Hopefully Spock’s arm doesn’t get too tired holding that salute for the next few decades. While these figures look great being placed on a shelf, they are a little disappointing when they’re put through the paces as speakers. More on that to come. I was easily able to connect each of them wirelessly as Bluetooth speakers using both my Mac and my iPhone. The setup will feel like second nature to anyone who’s connected Bluetooth audio peripherals in the past. Simply move the switch on the back of the chosen figure to the “Bluetooth” setting, make sure the unit is powered on, then connect through your device’s Bluetooth settings. Setup was super simple. WHILe not a big deal, my only gripe would be the not-so-recognizable name (“FT-SPK”) each speaker popped up with in Bluetooth settings. Adjacent to the USB input and the sound effects button, FameTek includes an auxiliary input that can be used in conjunction with the included 3.5mm stereo cable as an alternative to the wireless Bluetooth option. Testing the sound of the speakers, I fed three types of audio to each of them: The latest episode of the Trek Geeks podcast, Jerry Goldsmith’s Star Trek: The Motion Picture score and a few moments of Star Trek: Insurrection (streaming in HD). All of the audio was played through iTunes on my Mac and Apple’s standard Podcasts, Music and Video apps on my iPhone. The results were somewhat disappointing but not all that surprising. Listening to all three content types produced less-than-stellar somewhat “tinny” audio that has come to be expected from small wireless speakers. Considering the relative size of the speaker crammed into each figure and the quality of similarly sized Bluetooth speaker options, I’d consider these to have just missed the mark. 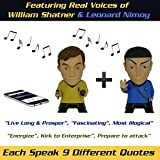 Both Kirk and Spock come with built-in sound effects, using William Shatner and Leonard Nimoy’s voices from The Original Series. 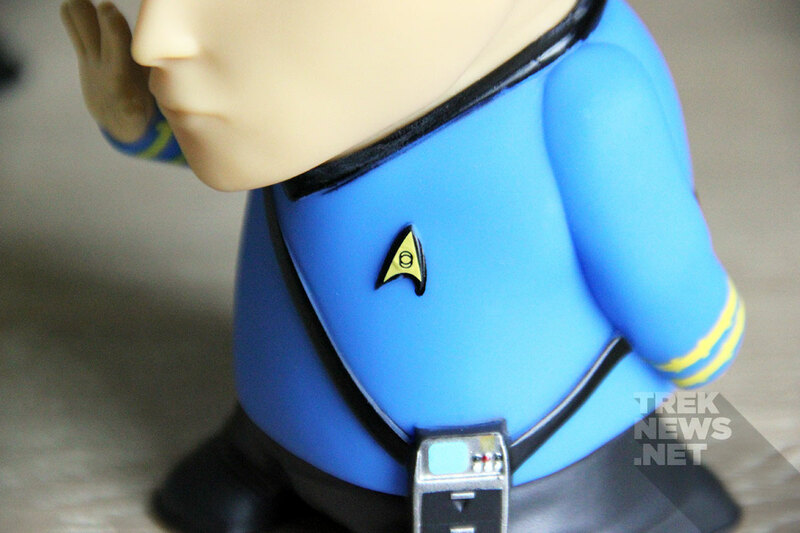 Pressing the effects button on their backs, connecting the unit to a Bluetooth device or the included USB cable will elicit memorable TOS quotes, like Spock saying “Fascinating,” “Live long and prosper,” and “Logical choice”, while Kirk says “Energize,” “Set phasers to stun,” and “Kirk to Enterprise”. It should be noted that with price point of $40–50, I went in understanding that I wouldn’t be hearing mind-blowing audio from these speakers. On the plus side, almost all of the Original Series quotes that come pre-loaded on these sound decently clear with some very light bass. If you’re looking for some 23rd century audio quality, you may want to look elsewhere. 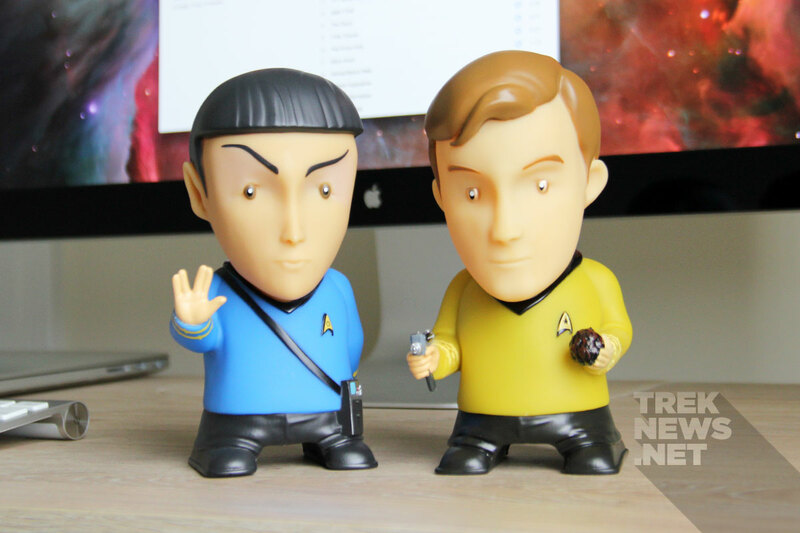 However, these Bluetooth speakers will look fantastic on a shelf or on your desk and will probably evoke compliments and curiosity from fellow Trekkies. 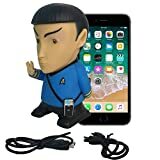 For those interested, you can order the Kirk and Spock Bluetooth speakers individually on Amazon for $40 or keep the duo together with a specially priced combo-pack for $65. You can visit FameTek‘s website for more information about their officially licenced Star Trek and Doctor Who products.